Posted on October 5, 2016 at 12:08 am. Sin City has been overrun by zombies in Microgaming’s latest slots, Lost Vegas. 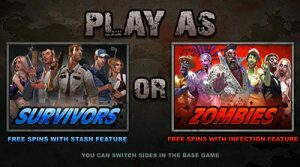 Players can choose between Zombie or Survivor in the immersive new Lost Vegas slot, set in the famous city of sin, Las Vegas. 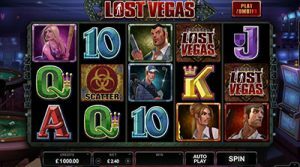 Set amongst the backdrop of a zombie apocalypse, Lost Vegas offers 243 ways-to-win across two themed styles, as deserted casinos and infected zombies constantly lurk in the background. There are a number of great bonus features in Lost Vegas, including Zombie Fist Of Cash, and a blackout bonus, which scans reels for Zombies or Survivors and pays out huge cash prizes at random. An exciting free spins feature is triggered whenever three or more scatter symbols appear across the reels, or when one scatter symbol lands on the reels during the Blackout Bonus feature. Both the Survivors and the Zombies offer unique gameplay features. The Survivors can battle their way through the apocalypse with an innovative Stash feature, in which low symbols are snatched off the screen to reveal cash prizes. For every symbol that’s removed, the chances of winning are increased, and the free spins continue until all of the low symbols have been stashed away. If you take the side of the Zombies, you’ll stand alongside an undead Elvis impersonator, because why not! It’s Vegas! The Zombie symbol stack landing feature infects all of the reels, with stacked symbols remaining until all five reels are infected. There’s 50 free spins on offer. Lost Vegas launches on desktop and mobile on Wednesday, October 5 2016, and can be played at all leading online casinos that host Microgaming and Quickfire games, including Royal Vegas. Sign up today for a $100 Welcome Bonus and 100 Free Spins. We have the reviews of the top casinos available online for you to research, but we highly recommend Bovada Casino as safest and the best online casino providing support for players from United States.